Is your husband passive aggressive? Men aren’t the only ones capable of being passive aggressive. Women can be too. I have a question and was wondering if you had any advice. I’ve been doing really good at sticking to my boundaries. There’s one I’m still shaky on. I usually have to wake my husband up 10 times on Sunday for church. I don’t do that anymore. I give him one wake up call and the rest is up to him. Some days he doesn’t wake up, and that’s fine. I get to church on time and enjoy the afternoon with my granny. We need to leave the house by 1030 to get to church on time. Some days he does get up. He gets up about 1015 and says he’s going to church and he does go. The problem? He doesn’t get in the car ready to leave until 1050 and then we are 10-15 minutes late. It doesn’t sound like a big deal but to me it is. We have someone to meet there, and so she’s left by herself while we are late every week. And the reason we are late Is that he wakes up on time but plays games on his phone until like 5 minutes before we have to leave. I have said hey maybe I can go and you meet me there. He says no because that’s a waste of gas. I’ve told him nicely that it’s once a week and if he wants to go it would mean a lot to me and my grandma if he could just make an effort to be on time that one day each week or just not go. He says he does make an effort, blah blah blah. I could just say well I’m leaving at 1030. If you are ready, great. If not, I’m going alone and you can meet me. The problem is if I go, he won’t go. But if I’m willing to wait and be 10-15 minutes late he will be there. And I love for him to be at church with me. What should I do or what would you do in this situation? I see a woman who deeply desires her husband to attend church with her – and she’s trying to control his behavior. Her heart isn’t wrong, but her actions aren’t netting the outcome she wants. I would even go so far as to say she’s “mothering” him. Adults don’t need other adults to wake them – he has a phone, it probably has an alarm on it. Here’s the problem as I see it, bearing in mind I only have her side of the story and I could be completely wrong: they’re both afraid. He’s afraid to tell her he doesn’t want to go, or maybe he does want to go but is afraid of God’s and her expectations if he goes and hears something he needs to change. Maybe this man isn’t sold out for Jesus Christ, and maybe he’s not interested in growing his faith at the moment. She’s afraid of letting him make his own decisions about attending. She’s afraid he won’t go. She wants him there, so she’s willing to make others wait just to get him to attend. What I recommend: CONVERSATION & BRAVERY. 1 Peter 3:6 she does what is right and does not give way to fear. Then she needs to let go of it. And then do what she said she was going to do – which is let him be responsible for his actions and let God deal with that, and she needs to leave when she said she was going to – even if she’s afraid he won’t go at all. Here’s why: his faith is not her responsibility. We can’t be our husband’s Holy Spirit. Remember that God created your husband in His image – just like He created you. So we need to treat each other with respect – and remember the preciousness of others as we interact. We need to own what’s our to own: “I feel nervous when I go to church alone, I’m afraid you and I don’t think about faith the same way, I’m concerned about … ” sans name-calling, labeling, etc. and staying focused on what we KNOW to be true, which is how WE feel – and talking about it in a way that discusses the FACTS and not ascribing motives to another’s behavior. Unfortunately in marriage, and in too many other relationships, we don’t consistently behave like respectful adults. We assume positions that are either parental or childish instead of adult. This doesn’t model the right stuff for our kids – and we all know what they see, they repeat. 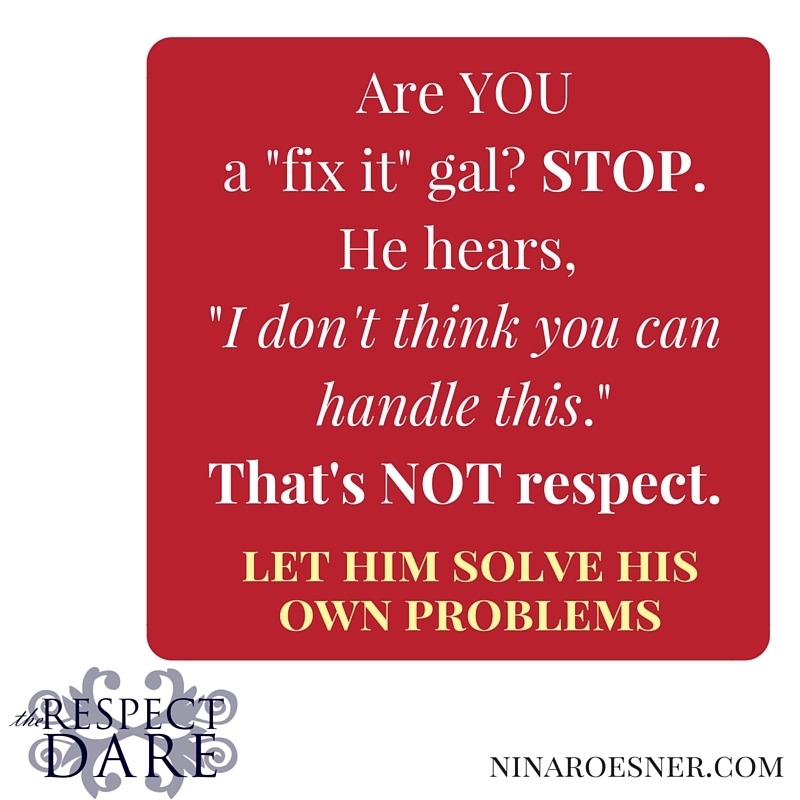 We think we need to “fix it” but in effect, we’re communicating, “I don’t think you can handle this.” Your husband (and often our kids) can solve their own problems – and it’s disrespectful to give unsolicited advice. If you are invited into his situation, GREAT. If not, the most we should do is let him know we’re praying for him and validate his feelings about whatever he’s dealing with. YES. WHATEVER. Even if you don’t agree – validate his feelings. But BOTTOM LINE FOR NOW: STOP giving unsolicited advice. 🙂 Even if you are right, it demotivates people and steals their enthusiasm – and more often than not, ownership of a problem and solution is more important than it being done “right” the first time anyway. You’ll see your marriage improve as a result. People feel the way they feel – and to say they are wrong feeling that way just keeps them feeling badly. Help your husband relieve stress by validating how he feels. We’ll talk more about that next time. FYI, this is the last week to sign up for our Strength & Dignity eCourse. It’s free and it’s for women who are struggling in their marriages. What about YOU? Do you find it hard to not give advice? Are you a “fixer” type? Do you find it hard to validate someone else’s feelings when you wouldn’t feel the same way? Oh, I can validate just about all his perspectives and all his sets of feelings and I DO but I can’t stop rendering “advice” to save my very soul. The crazy thing is that I am not even trying to “fix” anything. Not really. I’m just spewing forth “advice.” I just want someone to lecture. It must be some kind of numbing device. It is one of my battles: numbing devices & distancing mechanisms. When I do that I am forced to face my own issues. I want to externalize all my issues but I know that brings no real healing because it slows down a confrontation with the real issue, me. I can only deeply heal when I directly confront myself, my Christian ghosts. A confrontation with my own struggles, my personal ghosts, not his. Lecturing, like any frantic activity, creates a numbing effect so I don’t have to feel this horrible feeling of non-meaning in my world. It protects me from confronting my own personal issues. Rebecca… I really like you. 🙂 I love your transparent sweet raw self. Your prose is exceptional and makes me examine my own thoughts, motives, and feelings. The neat thing, Beloved, is when we come to the end of ourselves, there He is. 🙂 Waiting. 🙂 So I’m excited about your lecture ban. 🙂 Let us know how He meets with you there. 🙂 I can’t wait to hear. Seriously. Thank you so much Nina. I pray for you and Bonnie and Debbie and everyone on the prayer concerns/ requests lists daily. I love the new look of your organization’s website!!! “. . . The neat thing, Beloved, is when we come to the end of ourselves, there He is. Waiting. . . . “ —I love that!!! —That so blesses me. The lecture ban with my family is so, so hard! I am like a haunted house, so full of ghosts that I’d rather not face. —And face in silence by just being in His presence, still and listening. So many experts in both the sacred (—my Christian counselor) and secular camps offer me all manner of distractions to help me avoid confronting my ghosts. But while I am too busy to see them during the day, the specters come out at night. —Nina, I see them in the corridors of my dreams. Jesus has been encouraging me to face those ghosts head-on, rather than lecturing others endlessly about Bible text issues. I know He is doing it not so that I die of fright, but so that I might learn from my ghosts, be transformed by them and be freed from them. —For example, I will sing worship songs that proclaim “all I want is Jesus,” but I want LOTS of other things. Reality is a hard road! But as you say: “. . . .at the end of ourselves, there He is. Waiting. . . . “ I love that!!! —Again, that so blesses me. I agree with 90% but I disagree with one part. I dont think she should tell him she is leaving at 10:30. I think she should say to him, ” I like to leave at 10:30. Is it ok with you if I go ahead and leave if you are not ready or do you want me to wait on you? ” And about the other person meeting them…. That person should not play into the equation. Her husband comes first, before church or other people. He should only be second to God.